Waiting is hard to do. We like things to be instant. For instance, we like instant oatmeal, instant deposits, and even instant coffee! We like ready-made, pre-cooked and instant meals. This pre-occupation with ‘instant’ carries over into the area of relationships - and this can be dangerous. In relationships and dating the 'instant craving' causes anxiety which in turn causes us to get antsy during the wait. I completely understand this feeling as a seasoned single. I know how anxiety can sit in as the wait prolongs, sits and festers. So how do we calm down? What do we do while we wait? 1. Waiters Serve - Just like waiters serve the people at the table so should we serve Christ by serving God’s people. Participate in your church through various ministries, serve in your community through shelters or soup kitchens, and serve people in your life, making a positive impact in the lives of those you come in contact with. As a single you should always strive to see how you can serve others & how you can make things better. 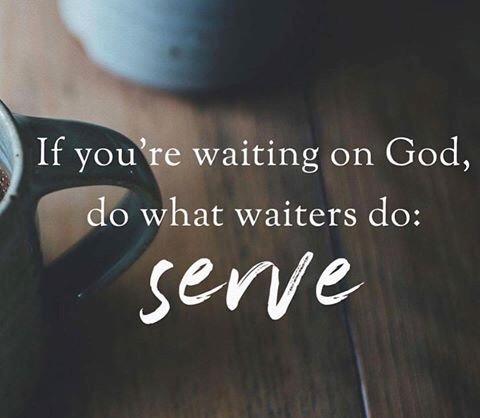 Concentrate on serving God and others and see how your life changes. Additionally, for those seeking God for a mate, what better way for your future mate to see you than serving God! Boaz saw Ruth when she was in the field working! 2. Waiters Smile - I can’t express to you the difference a smile makes when you see someone or are greeted by them. The amount of single women I see walking around with frowns is so disconcerting to me. Waiters in a restaurant smile because it makes people feel welcome and literally shifts the atmosphere to a more positive one. As a single woman, strive to be a woman who shifts the atmosphere into one that is life-giving. If you are hurting on the inside and can’t muster up a smile, pray and God will heal you so that you can be an atmosphere shifter! 3. Waiters Survey - An exceptional waiter surveys the table so that they can anticipate requests from the customers. During your waiting season, survey, scan and study those you help, so that you can anticipate their needs and exceed them. This goes back to making things better for those around you and shifting the atmosphere when you enter the scene. Why should you focus on serving, making things better, shifting the atmosphere and surveying those you serve? This is all great preparation for a spouse! You should always strive to make things better and create loving, positive and life-giving environments that people will want to be in and thrive in. The waiting season doesn't have to be one of angst, it should be a time that is fulfilling as you are constantly creating and living your best life! Thanks for the wonderful, encourging words, as we all strive to serve while waiting. Amen! Occupy until He comes!